Organizations: Sisters Science Club (Bob Collins, Cal Allen, David Hiller); Sisters Garden Club (Lorena Bliven, Winnie St. John); Sisters Kiwanis (Dave Marlow, Gary Kutz, Jeff Omodt, Dave Cox, John Troike, Dave Roberts); Sisters teachers (Kit Stafford, Rebecca Sokol, Scott Duggan, Carol Packard); school staff (Jim Golden, Leland Bliss) and maintenance personnel; numerous high-school and middle-school students. Community members: Mark Thompson; Bill McLaughlin; John Knox; Don Snack. neering, Inc.; Ponderosa Forge & Iron Works; Sisters Ace Hardware; Lowe's of Bend; Robinson & Owen; Redmond Greenhouse; Monte's Electric. Sisters Garden Club gave efforts to renovate the Sisters Middle School greenhouse a tremendous boost with a $5,000 donation. The garden club, the Sisters Science Club and numerous companies and individuals in Sisters (see sidebar) worked with project leaders David Hiller, Rebecca Sokol, and Kit Stafford. 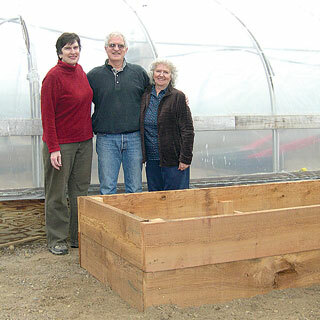 Kiwanis Club members and other folks in the community built raised beds with cedar boxes and greatly improved the plumbing and electrical systems in the greenhouse. "They had one outlet before, and they had hoses scattered everywhere and drip lines scattered everywhere," Hiller noted. Now, the greenhouse has a radiant greenhouse heater and an efficient plumbing system. Volunteers also installed rodent screening and repaired the greenhouse where needed. They also pitched in for a major cleanup of the grounds. "I had no idea of the scope of what had been done. It's amazing," said garden club president Winnie St. John during a site visit last month. All three Sisters schools will use the greenhouse. High school agriculture classes will work there, as will middle school science and art students. High school students will mentor elementary school students in nurturing initial starts. Students will have the opportunity to take their produce to farmer's markets, local restaurants and their own school cafeterias. In addition to growing vegetables, the greenhouse project will include a program for growing native species - grasses, shrubs, trees, to assist in various restoration projects. In a separate project on the adjacent athletic field, Kiwanis rallied support to install and plumb a drinking fountain. "Last year coaches and community members asked us if while we were modifying the domestic water system for the greenhouse, could we install a drinking fountain for the use of the student athletes, students, coaches, parents and visitors to use during practices and games since there is no outside water facilities for the playing fields," Hiller explained. "The Sisters Science Club agreed to install the fountain. The cost of an ADA-approved frost-free drinking fountain is approximately $4,000 plus shipping and handling. Sweeney Plumbing has generously agreed to install the fountain pro-bono when we have it purchased." The Sisters Garden Club was founded in 1988, with 13 members. There are currently 95 members. The club maintains four garden spots in the city of Sisters. Their one fundraiser each year is the Sisters Home & Garden Tour, set for Thursday, July 12, during the week leading up to the Sisters Outdoor Quilt Show. Tickets will be available starting June 1 at The Gallimaufry and at the Sisters Area Chamber of Commerce Visitors Center.